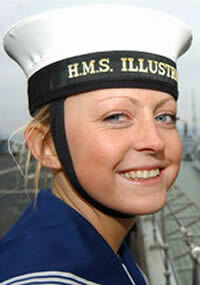 A Sailor Cap is a round, flat brimless hat worn by sailors across the world. A tally, a black silk ribbon with inscription, is tied around the base usually bearing the name of a ship or navy. The Sailor Cap may be embellished further with a badge, cockade or other accessory. Brimless caps of this kind began to be worn in the mid 19th century. The more rigid type of sailor hat with a wide, flat peak is also known as square rig, generally referred to a type of sailor uniform, cap or pork pie – not to be confused with the brimmed pork pie hat. The Sailor Cap was first introduced by the Russian Navy in 1811. It was a development of the peaked cap adapted for marine conditions. US Navy sailors wear a unique white canvas hat with an upright brim, often referred to as a ‘Dixie cup’ in reference to its similarity to the shape of a common disposable drinking cup.